Yipee! We are now at our half way mark of having this child! I have just realized that I havent put a picture of my tummy up yet but I also really havent started showing until now, I have gained 5 pounds so far. Our baby is very healthy and strong the doc said and here are a couple photos, the first one is him flexing for the camera and the other is of his developing profile. I am no longer sick which has made me the happiest person ever! I actually have started to feel him move which I thought would be really weird but it is actually really cool! I now look for chances to sit down and hold really still so he can kick and punch me to my knowledge! I am looking forward to the next 4 months and hoping that I can keep enjoying it like I have this past week. Ty has started up in school again and he actually likes 2 of his teachers this semester which is a good thing. He has so much homework this time though, big fat bummer! I really cant believe we are going into February already. This baby is going to be here before I know it. I don't know how I missed the post about you finding out it's a boy! Congratulations! That is so exciting! You are the cutest Al. I hope to have only gained 5 lbs half way through. I will be a very happy woman if that is the case. 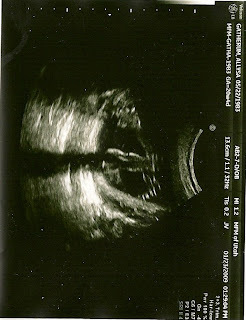 I love the profile ultrasound. His little nose is so cute. I can't wait to meet baby boy! Im so glad you are feeling better!! Those pics are so fun!! Its such a crazy thing to be able to take a peek at what they are doing! You guys are so cute! 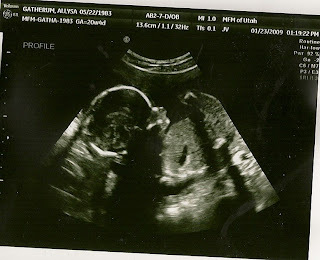 For some reason I remember the last trimester being really good, and I was really happy. As long as there is no sickness I'm happy! So you will do awesome! You look so cute Ally! I still can't believe that you guys are having a little baby. That is so fun! We need to get together. I am so happy for you and Tyler! It's so great to hear and see that all is going so well. I remember the collage days and all I can say is...it is so worth it in the end!! You guys are awesome and you're going to have the most beautiful little boy ever. You look so cute! And I am glad that you aren't sick anymore...that is no fun at all! Hey girl, I desperately need to get my hair done. I'm sure you could do a great job! Are you pretty booked? I STILL don't believe your prego! Just Kidding! What great pics! Congrats honey! You're getting closer! Have you guys thought of names yet? Be sure to let me know where you are registered! I'd love to get you guys something to help out with your little man!! Wow, I can't believe your already half way there. That is so exciting. The last half was my favorite. It's the best being able to feel them move around. I miss seeing you on a weekly basis! How is everyone at the salon? 1/2 way-you're on a roll! CONGRATS! each day is just another day closer to your whole world being changed and and meeting your little man and all the blessings in store of being a parent. Hope you're feeling better and staying healthy. I can't believe you are already half-way there and you look so good! How fun to have a little boy! I miss seeing you, hope all is well! I just won't stand next to you. I'm 2 weeks behind you and twice as big! Glad you're feeling better! You look darling as usual! 93 more days until your due! He will be here before you know it. We will have to get together and go do something. Hope things are going well!